NEW YORK -- Earth Day Initiative - a non-profit that promotes environmental awareness and solutions through partnerships with schools, community organizations, businesses, and governments - announces Count to 50. Find out more about their initiative, from the press release information below. Leading up to the 50th anniversary of Earth Day in 2020, this three-year campaign aims to switch apartments, houses, and offices over to clean energy. Count to 50 coincides with Earth Day Initiative's 47th annual Earth Day celebrations, taking place on April 18, in New York City. In several states, including New York, Ohio, and Washington, DC, consumers can choose their energy supplier and divert their monthly utility bill away from dirty energy and toward clean energy simply by filling out a quick online form. In the rest of the country, consumers can take advantage of the services offered by our partners to match their energy usage with Renewable Energy Certificates. In either case, the sign-up process takes only a few minutes and can turn a monthly utility bill into a tool for good. The Count to 50 campaign is also releasing a series of toolkits that make it easy for individuals, schools, community organizations, and businesses to engage their communities in real and impactful ways. "In the face of our government abandoning scientific fact and urgent environmental issues, we've really seen a surge in demand for simple ways people can initiate positive changes," said Earth Day Initiative's Executive Director, John Oppermann. "Collectively, individual actions can make a difference. That's why our goal with the Count to 50 campaign is to enable people to make a real and ongoing impact in a matter of minutes." 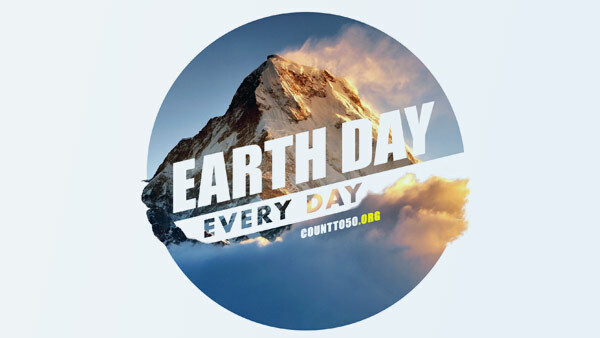 Count to 50 will officially kick off at Earth Day New York, one of the most popular Earth Day events in the country taking place in Union Square on Tuesday, April 18, noon-7:00pm. Free and open to the public, the annual festival celebrates Earth Day and offers visitors easy, actionable ways to make more sustainable and environmentally conscious choices in their everyday lives. Attendees are encouraged to bring their utility bills to sign up for clean energy at the event. On Friday, April 21, Earth Day New York will organize the third annual Earth Day 5K Green Tour. New Yorkers are invited to get outside and visit green organizations around the city. The tour will include stops at Battery Urban Farm, LEED Platinum designed luxury residence The Solaire, Toyota's green vehicle display, and other destinations, as well as an introduction to the Count to 50 campaign. On the tour, visitors will learn how to get involved, volunteer, and stay connected to green causes throughout the year. Visit here to register. Tour attendees will also visit a special pop-up hosted by Earth Day Initiative and kargoe, the first conscious-driven social marketplace, at 558 West 21st Street in Manhattan. Throughout May and June, visitors can stop by on Thursdays 6-8pm and Saturdays 11am-6pm, to learn more about Count to 50 and kargoe, while checking out socially responsible vendors. Earth Day Initiative is a 501(c)(3) non-profit organization, which aims to make Earth Day more than a one-day event or annual environmental wake-up call by engaging people in important sustainability work and initiatives throughout the year. The organization's mission is to carry the enthusiasm and spirit of Earth Day into the 21st Century to meet today's environmental challenges. It does so through year-round sustainability programs, annual large-scale Earth Day events, and partnerships with schools, community organizations, businesses, and governments. Its programs include high-profile environmental campaigns, corporate sustainability initiatives, a sustainable food guide, a school gardens program, and a green building publication.